“40 CFR” means Title 40 of the Code of Federal Regulations, which is the codification of general and permanent rules published in the Federal Register by the executive departments and agencies of the federal government. “ADT” means average daily traffic. AKART. “All known, available and reasonable methods of prevention, control and treatment” refers to the State Water Pollution Control Act, RCW 90.48.010 and 90.48.520. “Applicant” means the person, party, firm, corporation, or other legal entity that proposes to develop property in the City of Lakewood by submitting an application for any of the activities covered by these regulations on a form furnished by the City and paying the required fees. “Arterial” means a road or street primarily for through traffic. The term includes roads or streets considered collectors. It does not include local access roads which are generally limited to providing access to abutting property. “Average daily traffic” or “ADT” means the total traffic during a given time period (in whole days), greater than one day and less than one year, divided by the number of days in that time period. To determine potential ADT for a local access City street, it will be assumed, for the purposes of this title only, that each dwelling unit or each existing or proposed segregated lot that accesses onto the street will generate 10 traffic trips per day. Traffic generation for other uses will be in accordance with the publication “Trip Generation,” by the Institute of Traffic Engineers, or other approved sources and will include the traffic generated by the proposed development unless otherwise noted. Projects submitted to the City for review and approval will be considered to be proposed projects. “Base flood elevation” means the water surface elevation, in feet, above mean sea level for the base flood and referenced to the National Geodetic Vertical Datum of 1929 (or Pierce County Datum or United States Coast and Geodetic Survey 1929 Datum which are the same). “Bench” means a relatively level step excavated into natural earth or fill material. “Best management practices (BMPs)” means the schedules of activities, prohibitions of practices, maintenance procedures, and structural and/or managerial practices approved by the Washington State Department of Ecology that, when used singly or in combination, prevent or reduce the release of pollutants and other adverse impacts to waters of Washington State. “BMP” means best management practices. “Building” means any structure used or intended for supporting or sheltering any use or occupancy. “Certification” means a written engineering opinion, stamped, signed, and dated by an engineer, concerning the progress or completion of work. “Change of use” means a change of use shall be determined to have occurred when it is found that the general character of the use in question has been modified. This determination shall include review of but not be limited to: hours of operation, materials processed or sold, required parking, traffic generation, impact on public utilities, clientele, general appearance and location or a change in use type. “City” means the City of Lakewood or an official representative of the City of Lakewood. “City Engineer” means the individual appointed to be the City Engineer for the City of Lakewood or his/her designee. “City Environmental Official” means the individual appointed to be the Environmental Official for the City of Lakewood or his/her designee. Clean Water Act (formerly referred to as the Federal Water Pollution Control Act or Federal Water Pollution Control Act Amendments of 1972) Pub. L. 92-500, as amended Pub. L. 95-217, Pub. L. 95-576, Pub. L. 6-483 and Pub. L. 97-117, 33 U.S.C. Section 1251 et seq. “Clearing” means the cutting, moving on site, or removal of standing or fallen timber (including stumps); the removal or moving on site of stumps; or the cutting or removal of brush, grass, ground cover, or other vegetative matter from a site in a way which exposes the earth’s surface of the site. In addition to the above, clearing is an activity which does not require reforestation per an approved forest practices application/notification issued by the Department of Natural Resources. “Compaction” means the densification of a fill by mechanical means. “Cul-de-sac” means a circular pavement symmetrical or offset about the centerline of a dead-end street. “Dedication” means a conveyance of land by the owner of the land to some public use through a clause or conveyance in a deed or some other instrument of conveyance or a duly filed plat. “Detention” means the short-term storage of storm drainage runoff that has been artificially collected and then released at a predetermined rate. “Development” means any action taken either in conjunction with a use or to make a use possible. Activities do not in and of themselves result in a specific use. Most activities may take place in conjunction with a variety of uses. Deviation. A deviation from the engineering standards is a mechanism to allow the City Engineer to grant an adjustment in the application of engineering standards. “DOE” means Washington State Department of Ecology. “DOE Stormwater Manual” means the Stormwater Management Manual for Western Washington published by the Washington State Department of Ecology, 2005 Edition. “Drainage” means rainfall runoff from a basin or contributing area which flows on the surface of the ground. “Driveway” means any area, construction, or facility between a public road and private property which provides access for vehicles from the public roadway to or from private property. “Dwelling” means a building or portion thereof designed exclusively for human habitation, but not including hotels or motel units. “Dwelling unit” means any building or portion thereof which contains living facilities, including provisions for sleeping, eating, cooking and sanitation for not more than one family. “Earth/earth material” means naturally occurring rock, soil, stone, dirt, or a combination thereof. “Earthwork” means any operation involving the excavation, grading, filling, or moving of earth materials. “Easement” means a grant by the property owner of the use of a strip of land by the public, corporation, or persons for specific purposes. “Effective impervious surface” means those impervious surfaces that are connected via sheet flow or discrete conveyance to a drainage system. Impervious surfaces are considered ineffective if (1) the runoff is dispersed through at least 100 feet of native vegetation in accordance with BMP T5.30 “Full Dispersion,” as described in Chapter 5 of Volume V of the Stormwater Management Manual for Western Washington (SMMWW); (2) residential roof runoff is infiltrated in accordance with Downspout Full Infiltration Systems in BMP T5.10A in Volume III of the SWMMWW; or (3) approved continuous runoff modeling methods indicate that the entire runoff file is infiltrated. “Emergency vehicle (EV) access” means an all-weather drivable surface constructed and maintained in accordance with this title that provides emergency access between a public or private street and 150 feet of all portions of an exterior wall of the first story of any structure requiring EV access as measured by an approved route around the exterior of the building. “Engineer” (also “project engineer”) means a professional civil engineer, currently licensed in the state of Washington, retained by and acting on behalf of the applicant. “Erodible or leachable materials” means wastes, chemicals, or other substances that measurably alter the physical or chemical characteristics of runoff when exposed to rainfall. Examples include erodible soils that are stockpiled, uncovered process wastes, manure, fertilizers, oily substances, ashes, kiln dust, and garbage dumpster leakage. “Excavate” means the removal by man of sand, sediment, or other material from an area of land or water for other than commercial or industrial use. “Fill” means the placement by man of sand, sediment or other material to create new uplands or raise the elevation of the land. “Filling” means the act of transporting or placing (by any manner or mechanism) earth material, including temporary stockpiling. “Financial guarantee” means an assignment of funds, surety bond, cash guarantee, escrow account assignment of savings, irrevocable letter of credit, or other means acceptable to or required by the City Engineer or Director of Community Development to guarantee work is in compliance with all applicable requirements. “Flood” or “flooding” means a general and temporary condition of partial or complete inundation of normally dry land areas from the overflow of inland or tidal waters, and/or the unusual and rapid accumulation of runoff of surface waters from any source. “Floodway” means the channel of a river, or other watercourse, and the adjacent land areas that shall be reserved in order to convey and discharge the base flood without cumulatively increasing the water surface elevation by more than one foot, and those areas designated as deep and/or fast-flowing water. “Frontage” refers to length of a property line along a public street or right-of-way. “Gate” (at driveway entrance) means a movable fence or other blockade designed to prevent general purpose traffic from entering a private development. “Grading” means any excavating, filling, or creating of impervious surfaces or combination thereof. “Ground water” means subsurface water in the subsoil or in a zone of saturation. “Grubbing” means the removal and disposing of all unwanted vegetative matter from underground, such as sod, stumps, roots, buried logs, or other debris. “Hard surface” means an impervious surface, a permeable pavement, or a vegetated roof. “Hearing Examiner” means a person appointed by the City to carry out the functions authorized under Chapter 18A.02 LMC, Administration, and Chapter 35A.63 RCW. “Hyperchlorinated” means water that contains more than 10 mg/L chlorine. “IBC” means International Building Code. “IFC” means International Fire Code. “Impervious surface” means a nonvegetated surface area that either prevents or retards the entry of water into the soil mantle as it entered under natural conditions prior to development. Common impervious surfaces include but are not limited to rooftops, concrete or asphalt paving, paved walkways, patios, driveways, parking lots or storage areas, grasscrete, and oiled, macadam or other surfaces, which similarly impede the natural infiltration of surface water. Open, uncovered retention/detention facilities shall not be considered impervious surfaces for purposes of determining whether the thresholds for application of minimum requirements are exceeded. Open uncovered retention/detention facilities shall be considered impervious surfaces for purposes of runoff modeling. “Land disturbing activity” means any activity that results in a change in the existing soil cover (both vegetative and nonvegetative) and/or the existing soil topography. “Land disturbing activities” include, but are not limited to, clearing, grading, filling, and excavation. Compaction that is associated with stabilization of structures and road construction shall also be considered a land disturbing activity. Vegetation maintenance practices, including landscape maintenance and gardening, are not considered land disturbing activity. Storm water facility maintenance is not considered land disturbing activity if conducted according to established standards and procedures. “Land surveyor” means a professional land surveyor currently licensed by the state of Washington. “Landscaping” means the improvement or installation on a parcel or portion thereof of objects or vegetation for decorative or ornamental effect. Examples include: trees, bushes, shrubs, flowers, grass, weeds, ornamental rocks or figures, and low-lying ground cover, sprinkler systems, sidewalks, and lighting fixtures. Large Lot. As defined by the City of Lakewood Subdivision Code. “Level of service” means a way to measure the level of traffic congestion, with “A” being the best level of service, and “F” the lowest. “Local improvement district” means a special assessment district whereby a capital improvement is financed and paid for over a period of time through assessments on the benefiting properties. “LOS” means level of service. “Maintained city street” means a road dedicated to the City through various legal instruments or processes, or claimed through usage, and maintained by City maintenance forces on a periodic and regular basis, or as determined by the City. The road shall be listed on the City of Lakewood most recent road log or accepted by the City for inclusion into the City’s road system and not yet shown on the road log. “Maintenance” means the regular and continual preservation of the private street and appurtenant features within the easement in an “as new” condition. “Major municipal separate storm sewer outfall” means a municipal separate storm sewer outfall from a single pipe with an inside diameter of 36 inches or more, or its equivalent (discharge from a single conveyance other than circular pipe which is associated with a drainage area of more than 50 acres); or for municipal separate storm sewers that receive storm water from lands zoned for industrial activity (based on comprehensive zoning plans or the equivalent), an outfall that discharges from a single pipe with an inside diameter of 12 inches or more or from its equivalent (discharge from other than a circular pipe associated with a drainage area of 12 acres or more). “Maximum extent practicable (MEP)” refers to paragraph 402(p)(3)(B)(iii) of the Federal Clean Water Act which reads as follows: Permits for discharges from municipal storm sewers shall require controls to reduce the discharge of pollutants to the maximum extent practicable, including management practices, control techniques, and system, design, and engineering methods, and other such provisions as the Administrator or the State determines appropriate for the control of such pollutants. “Median” means the portion of a divided street separating the traveled way for traffic in opposing directions. “MEP” means maximum extent practicable. “Motor vehicle” includes every device capable of being moved upon a public highway and in, upon, or by which any persons or property is or may be transported or drawn upon a public highway except for mopeds, bicycles and other devices moved by human or animal power or used exclusively upon stationary rails or tracks. “Municipal separate storm sewer (MS4)” means a conveyance or system of conveyances (including roads with drainage systems, municipal streets, catch basins, curbs, gutters, ditches, manmade channels, or storm drains) (1) owned or operated by a state, city, town, borough, county, parish, district, association, or other public body (created by or pursuant to state law) having jurisdiction over disposal of wastes, storm water, or other wastes, including special districts under state law such as a sewer district, flood control district or drainage district, or similar entity, or an Indian tribe or an authorized Indian tribal organization, or a designated and approved management agency under Section 208 of the Clean Water Act that discharges to waters of the United States; (2) designed or used for collecting or conveying storm water; (3) which is not a combined sewer; (4) which is not part of a publicly owned treatment works (POTW) as defined at 40 CFR 122.2; and (5) which is defined as “large,” or “medium” or “small” or otherwise designated by the Department of Ecology pursuant to 40 CFR 122.26. “MUTCD” means the Manual on Uniform Traffic Control Devices. “National Pollutant Discharge Elimination System (NPDES)” means the national program for issuing, modifying, revoking, and reissuing, terminating, monitoring and enforcing permits, and imposing and enforcing pretreatment requirements, under Sections 307, 318, 402, and 405 of the Federal Clean Water Act, for the discharge of pollutants to surface waters of the state from point sources. These permits are referred to as NPDES permits and, in Washington State, are administered by the Washington Department of Ecology. “Native vegetation” means vegetation comprised of plant species, other than noxious weeds, that are indigenous to the coastal region of the Pacific Northwest and which reasonably could have been expected to naturally occur on the site. Examples include trees such as Douglas fir, western hemlock, western red cedar, alder, big-leaf maple, and vine maple; shrubs such as willow, elderberry, salmonberry, and salal; and herbaceous plants such as sword fern, foam flower, and fireweed. “New development” means land disturbing activities, including Class IV general forest practices that are conversions from timber land to other uses; structural development, including construction or installation of a building or other structure; creation of impervious surfaces; and subdivision, short subdivision and binding site plans, as defined and applied in Chapter 58.17 RCW. Projects meeting the definition of redevelopment shall not be considered new development. “Occupancy” means the purpose for which a building is used or intended to be used. The term shall also include the building or room housing such use. Change of occupancy is not intended to include change of tenants or proprietors. “Outfall” means point source as defined by 40 CFR 122.2 at the point where discharges leave the MS4 and discharges to waters of the state and does not include open conveyances connecting two municipal separate storm sewers, or pipes, tunnels, or other conveyances which connect segments of the same stream or other waters of the state and are used to convey waters of the state. “Owner” means the owner of record of real property as shown on the tax rolls of the Pierce County Assessor, or a person who is purchasing a piece of property under contract. “Parcel” means any portion, piece, or division of land. Fractional part or subdivision of block, according to plat or survey; portion of platted territory measured and set apart for individual and private use and occupancy. “Parking area” means an area accessible to vehicles, which area is provided, improved, maintained, and used for the sole purpose of accommodating a motor vehicle. “Paved road” means a road that has been treated or covered with asphalt to create an oil mat surface; a road that has a bituminous surface treatment, asphalt, or cement concrete surface. “Paved surface” means minimum of two inches of hot mix asphalt per Washington State Department of Transportation specifications, or six inches of Portland cement concrete. “Percolation” means the downward or lateral movement of water through soil under either saturated or unsaturated ground conditions. “Permanent erosion control” means continuous on-site and off-site control measures that are needed to control conveyance and/or the deposit of earth, turbidity, or pollutants after construction or development. “Person” means an individual, partnership, corporation, or other legal entity. “Plat” means a map or representation of a subdivision, showing thereon the division of a tract or parcel of land into lots, blocks, streets, and alleys or other division and dedications. “Pollution-generating impervious surface (PGIS)” means those impervious surfaces considered to be significant sources of pollutants in storm water runoff. Such surfaces include those that are subject to vehicular use, industrial activities, or storage of erodible or leachable materials, wastes or chemicals, and that receive direct rainfall or run-on or blow-in of rainfall. Metal roofs are considered to be PGIS unless coated with an inert, nonleachable material. Roofs that are subject to venting of indoor pollutants from manufacturing, commercial or other operations or processes are also considered PGIS. “Pollution-generating pervious surfaces (PGPS)” means any nonimpervious surface subject to vehicular use, industrial activities or storage of erodible or leachable materials, wastes or chemicals, and that receives direct rainfall or run-on or blow-in of rainfall, use of pesticides and fertilizers or loss of soil. Typical PGPS include permeable pavement subject to vehicular use, lawns, landscaped areas, golf courses, and parks. “Predeveloped condition” means the native vegetation and soils that existed at a site prior to the influence of Euro-American settlement. The predeveloped condition shall be assumed to be a forested land cover unless reasonable, historic information is provided that indicates the site was prairie prior to settlement. “Private drainage system” means a system that is totally owned and maintained by an individual, joint venture, partnership, corporation, or other legal entity. “Private street” means a street which is owned, controlled, and maintained by one or more property owners. “Private street easement” means an easement or parcel which creates a legal source of access from a public street to an existing or proposed lot or lots of record or project, across other parcels of property. “Process wastewater” means any water which, during manufacture or processing, comes into direct contact with or results from the production or use of any raw material, intermediate product, finished product, byproduct, or waste product. “Project engineer” means a professional civil engineer, currently licensed in the state of Washington, retained by and acting on behalf of the applicant. “Project site” means that portion of a property, properties, or right-of-way subject to land disturbing activities, new impervious surfaces, or replaced impervious surfaces. “Public drainage system” means a system that is owned by the City of Lakewood or exists through accepted easements. “RCW” means Revised Code of Washington. “Receiving waters” means bodies of water or surface water systems to which surface runoff is discharged via a point source of storm water or via sheet flow. Ground water to which surface runoff is directed by infiltration. “Record drawings” means drawings that reflect changes made during the construction process, recording differences between the original design and the completed structure. “Recorded” means, unless otherwise stated, filed for record with the Auditor of the County of Pierce, state of Washington. “Redevelopment” means, on a site that is already substantially developed (i.e., has 35 percent or more of existing impervious surface coverage), the creation or addition of impervious surfaces; the expansion of a building footprint or addition or replacement of a structure; structural development including construction, installation or expansion of a building or other structure; replacement of impervious surface that is not part of a routine maintenance activity; and land disturbing activities. “Replaced hard surface” means, for structures, the removal and replacement of hard surfaces down to the foundation. For other hard surfaces, the removal down to bare soil or base course and replacement. “Replaced impervious surface” means, for structures, the removal and replacement of any exterior impervious surfaces or foundation; or, for other impervious surfaces, the removal down to bare soil, or base course, and replacement. Exemptions and partial exemptions are defined in Appendix 1 of the City’s NPDES permit. “Retention” means the long-term storage of water on site with the dissipation of said water into the ground by means of percolation. “Right-of-way (ROW)” means that area of land dedicated for public road uses including all road appurtenances, secured by the county or the public for purposes of public traffic, drainage, and/or franchised utilities. “Runoff” means that portion of the precipitation on a drainage area that is discharged in the form of overland flow from the area to downhill properties, watercourses, or pipe systems. “Safety concern” means geometric or design conditions on an existing, maintained City street that does not meet the standards of these regulations or the City Engineering Standards Manual. “Sensitive area” means those areas designated by resolution or ordinance of the City of Lakewood City Council pursuant to LMC Title14 and WAC 197-11-908. “SEPA” means Washington State Environmental Policy Act. “Significant contributor” means a discharge that contributes a loading of pollutants considered to be sufficient to cause or exacerbate the deterioration of receiving water quality or instream habitat conditions. “Site” means any parcel or combination of contiguous parcels where grading, filling, clearing, or creation of an impervious surface is proposed, and which may be controlled by more than one property owner. “Site development permit” means a permit issued by the City of Lakewood authorizing the applicant to access the property; fill, grade or create an impervious surface or any combination thereof. Site Development Plan“Site development plans” shall include the following, as specifically required by the City in each instance: Site plan, erosion and sedimentation control plan, grading plan, storm drainage plan, storm water drainage control report, soils report, flood study, entering sight distance variances and verifications, and other documents required in the review of proposed development of the property. “Site-specific traffic” means that traffic generated by a development. This traffic volume(s) shall be used to determine measures necessary to mitigate significant impacts on the City’s street system. “Soils engineer” means a professional civil engineer, licensed by the state of Washington, and experienced and knowledgeable in geotechnical engineering. “Source control BMP” means a structure or operation that is intended to prevent pollutants from coming into contact with storm water through physical separation of areas or careful management of activities that are sources of pollutants. The SWMMWW separates source control BMPs into two types. Structural source control BMPs are physical, structural, or mechanical devices, or facilities that are intended to prevent pollutants from entering storm water. Operational BMPs are nonstructural practices that prevent or reduce pollutants from entering storm water. See Volume IV of the SWMMWW for details. “Stockpiling” means the placement of material that will be removed within a six-month period or material that is placed on the property of a licensed business for sale. “Storm water” means runoff during and following precipitation and snowmelt events, including surface runoff, drainage or interflow. “Stormwater Management Manual for Western Washington (DOE Stormwater Manual)” means the five-volume technical manual (publication number 14-10-055 for the 2012 version amended in December 2014) prepared by Ecology for use by local governments that contains BMPs to prevent, control, or treat pollution in storm water. 8Other such improvements deemed necessary by the City Engineer. The improvements may be required to be installed along the entire length of abutting public street frontage of property being developed, or for a greater length, as determined by the City Engineer as a condition of project approval for a new construction, new subdivision, short plat, or addition, alteration or tenant improvement project, a local improvement district, or City project. All such frontage improvements shall be constructed to City specifications. “Structure” means anything that is constructed in or on the ground or over water, including any edifice, gas or liquid storage tank, and any piece of work artificially built up or composed of parts and joined together. Subdivision or Formal Plat. As defined in the City of Lakewood Subdivision Code. “Subdivisions” means any division or redivision of land into lots, tracts, parcels, or sites for the purpose of sale, lease, or transfer of ownership by formal plat, short plat, large lot division, or planned development district, or other subdivisional process. “Surveyor” means a professional land surveyor, currently licensed in the state of Washington and retained and acting on behalf of the applicant. 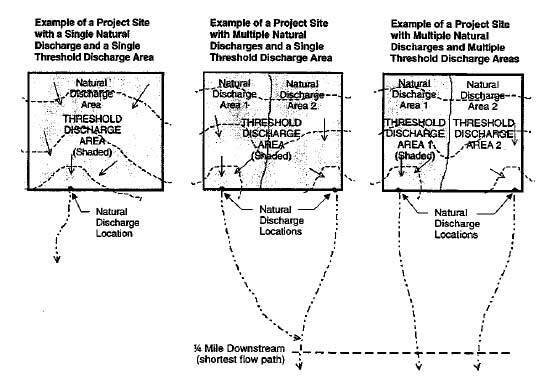 “Threshold discharge area” means an on-site area draining to a single natural discharge location or multiple natural discharge locations that combine within one-quarter mile downstream (as determined by the shortest flow path). The examples in Figure 14.1 below illustrate this definition. The purpose of this definition is to clarify how the thresholds are applied to project sites with multiple discharge points. For projects where storm water will be infiltrated on site the threshold discharge area shall be defined as the entire project area. Total Maximum Daily Load (TMDL)A water cleanup plan, TMDL is a calculation of the maximum amount of a pollutant that a water body can receive and still meet water quality standards, and an allocation of that amount to the pollutant’s sources. A TMDL is the sum of the allowable loads of a single pollutant from all contributing point and nonpoint sources. The calculation shall include a margin of safety to ensure that the water body can be used for the purposes the state has designated. The calculation shall also account for seasonal variation in water quality. Water quality standards are set by states, territories, and tribes. They identify the uses for each water body, for example, drinking water supply, contact recreation (swimming), and aquatic life support (fishing), and the scientific criteria to support that use. The Clean Water Act, Section 303, establishes the water quality standards and TMDL programs. “Tract” means any parcel of land, lot, building site, or contiguous combination thereof devoted to or intended to be devoted to a principal use and any other uses customarily accessory thereto. “Traffic impact analysis” means an in-depth analysis of the traffic generated by a new development, redevelopment or increase of traffic related trips due to change of use and its impacts on the surrounding street system. Data shall be presented by a licensed engineer who has special training in and practices in the profession of traffic engineering. “Traffic impact area” means all public roads within an area which would be impacted by the proposed project. “Traveled way” means the improved driving surface of the road normally used by the traveling vehicle. “Trip generation analysis” means a reporting of the number of vehicular trips generated, both average daily traffic (ADT) and p.m. peak hour, by proposed new development, redevelopment or increase of traffic related trips due to change of use. The data may be obtained from the latest edition of the Institute of Transportation Engineers (ITE) manual. Data does not need to be presented by a traffic engineer unless, due to its absence in the ITE manual, traffic data shall be collected. “USC&GS” means United States Coast and Geodetic Survey. “USGS” means United States Geodetic Survey. “Utilities” means public or private facilities including electrical substation, electrical generation facilities, electrical transmission, telephone or communication lines, pipelines, sewer lines, water lines, natural gas lines, or similar transmission facilities, natural gas gate valve and storage facilities, sewage collection and treatment facilities, waste disposal facilities, waste transfer facilities, and water supply facilities. “Variance” means a modification of regulations of this title when authorized by the Hearing Examiner after finding that the literal application of the provisions of this title would cause undue and unnecessary hardship in view of certain facts and conditions applying to a specific parcel of property. “Water quality standards” means Surface Water Quality Standards, Chapter 173-201A WAC; Ground Water Quality Standards, Chapter 173-200 WAC; and Sediment Management Standards, Chapter 173-204 WAC. “Watercourse” means a river, stream, creek, or other course of flowing water which flows intermittently or perennially and discharges into another watercourse or body of water. “Waters of the state” means those waters as defined as “waters of the United States” in 40 CFR Subpart 122.2 within the geographic boundaries of Washington State and “waters of the state” as defined in Chapter 90.48 RCW which includes lakes, rivers, ponds, streams, inland waters, underground waters, salt waters and all other surface waters and watercourses within the jurisdiction of the state of Washington. “Wetland” or “wetlands” means an area or areas that are inundated or saturated by surface water or ground water at a frequency and duration sufficient to support, and that under normal circumstances do support, a prevalence of vegetation typically adapted for life in saturated soil conditions. “Wetlands” generally include swamps, marshes, bogs, and similar areas. “Wetlands” do not include those artificial wetlands intentionally created from nonwetland sites, including, but not limited to, irrigation and drainage ditches, grass-lined swales, canals, detention facilities, wastewater treatment facilities, farm ponds, and landscape amenities or those wetlands created after July 1, 1990, that were unintentionally created as a result of the construction of a road, street, or highway. However, wetlands include those artificial wetlands intentionally created to mitigate conversion of wetlands.